As the international community debates the post-2015 development goals, there is an increasing realisation that governance is fundamental. Recent research shows that the capacity of the state to deliver on a wide range of development outcomes is vital for governance to achieve sustainable development. 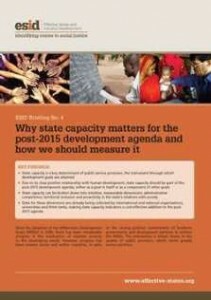 This suggests that state capacity should be part of the post-2015 agenda, either as a goal itself or as a component of other goals. The stark variation in MDG attainment calls for a better understanding of which forms of state capacity are needed by governments. Improved knowledge starts with measurement. Dimensions of state capacity which can be measured are: administrative competence, territorial inclusion, and the proactivity of the state’s relations with society. Data for these dimensions are already being collected by international and national organisations, universities and think tanks, making state capacity indicators a cost-effective addition to the post-2015 agenda. State capacity is a key determinant of public service provision, the instrument through which development goals are attained. Due to its close positive relationship with human development, state capacity should be part of the post-2015 agenda, either as a goal itself or as a component of other goals. State capacity can be broken down into measurable dimensions: adminstrative competence, territorial inclusion and state proactivity. Data for these dimensions are already being collected, making state capacity indicators a cost-effective addition to the post-2015 agenda.